Over $3,280,587 grant dollars from federal, state, and industry. Over 129 research and extension publications (including refereed scientific papers, research bulletins, non-refereed papers, proceedings, department publications, extension circulars and NebGuides). Over 65 unpublished abstracts and industry grant reports. Kamble, Shripat T., C . L. Ogg, R. E. Gold and A. D. Vance. 1992. Exposure of Applicator and Residents to Chlordane and Heptachlor When Used for Subterranean Termite Control. Arch.Environ. Contam.. Toxicol. 22:253-259. Davis*, R. W. and S. T. Kamble. 1992. Distribution of Sub-Slab Injected Dursban TC (Chlorpyrifos) in a Loamy Sand Soil When Used for Subterranean Termite Control. Bull. Environ. Contam. Toxicol. 48:585-591. Kamble, S. T., M. E. Byers and J. F. Witkowski. 1992. Impact of Corn Canopy on Foliar Distribution of Chlorpyrifos (Lorsban) When Applied via a Center Pivot Irrigation System Bull. Environ. Contam. Toxicol. 48:656-661. Byers*, M. E., S. T. Kamble, J. F. Witkowski and G. Echtenkamp. 1992. Exposure of a Mixer-Loader to Insecticides Applied to Corn via a Center Pivot Irrigation System. Bull. Environ. Contam. Toxicol. 49:58-65. Kamble, S. T., M. E. Byers, J. F. Witkowski, C. L. Ogg and G. W. Echtenkamp. 1992. Field Worker Exposure to Selected Insecticides Applied to Corn via a Center-Pivot Irrigation. J. Econ. Entomol. 85(3):974-980. Prabhakaran*, S. K. and S. T. Kamble. 1993. Activity and Electrophoretic Characterization of Esterases from Insecticide Resistant Strains of German Cockroach, Blattella germanica (L.). J. Econ. Entomol. 86(4):1009-1013. Davis*, R. W. and S. T. Kamble. 1993. Microencapsulated Chlorpyrifos Distribution in Loamy Sand and Silty Clay Loam Soils When Applied with a Sub-slab Injector for Subterranean Termite Control. Bull. Environ. Contam. Toxicol. 50: 458-465. Byers*, M.E., S.T. Kamble and J.F. Witkowski. 1993. Drift during Center-Pivot Chemigation of Chlorpyrifos with and Without Crop Oil. Bull. Environ. Contam. Toxicol. 51:60-67. Prabhakaran*, S. K. and S. T. Kamble. 1994. Subcellular Distribution and Characterization of Esterase Isozymes from Insecticide Resistant and Susceptible Strains of German Cockroach, Blattella germanica (L.). J. Econ. Entomol. 87(3): 541-545. Davis*, R. W. and S. T. Kamble. 1994. Low Temperature Effect on Survival of the Eastern Subterranean Termite, Reticulitermes flavipes K. Environ. Entomol. 23(5): 1211-1214. Prabhakaran*, S. K. and S. T. Kamble. 1995. Purification and Characterization of an Esterase Isozyme from Insecticide Resistant and Susceptible Strains of German Cockroach, Blattella germanica (L.). Insect Biochem. Molec. Biol. 25(4): 519-524. Davis*, R. W., S. T. Kamble and S. K. Prabhakaran. 1995. Characterization of General Esterases in Workers of the Eastern Subterranean Termite. J. Econ. Entomol. 88(3): 574- 578. Prabhakaran*, S. K. and S. T. Kamble. 1996. Effects of Azadirachtin on Different Strains of German Cockroach. Environ. Entomol. 25(1):130-134. Prabhakaran*, S. K. and S. T. Kamble. 1996. Biochemical Characterization and Purification of Esterases from Strains of German Cockroach, Blattella germanica (L.). Archives of Insect Biochemistry and Physiology. 31:73-86. Wright, R. B., T. A. DeVries and S. T. Kamble. 1997. Pest Management Practices of Crop Consultants in the Midwestern USA. J. Prod. Agric. 10:624-628. Park*, No-Joong and S. T. Kamble. 1998. Comparison of Esterase Between Life Stages and Sexes of Resistant and Susceptible Strains of German Cockroach. J. Econ. Entomol. 91(5): 1051-1057. Park*, No-Joong and S. T. Kamble. 1999. Distribution of Esterases in Various Body Tissues of Susceptible and Resistant German Cockroaches. Ann. Entomol. Soc. Am. 92(4): 556-562. Pachamuthu*, Pari and S. T. Kamble. 1999. Virulence of Metarhizium anisopliae Strain ESC-1 to German Cockroaches. J. Econ. Entomol. 92(2): 340-346. Pachamuthu*, Pari and S. T. Kamble. 2000. In Vivo Study on Combined Toxicity of Metarhizium anisopliae Strain ESC-1 with Sublethal Doses of Chlorpyrifos, Propetamphos and Cyfluthrin to German Cockroaches. J. Econ. Entomol. 93(1): 60-70. Clark, Thomas, L., J. E. Foster, S. T. Kamble and E. A. Heinrichs. 2000. Comparison of Bt (Bacillus thuringiensis Berliner) Maize and Conventional Measures for Control of the European Corn Borer. J. Entomol. Sci. 35(2):118-128. Park*, No-Joong and Shripat T. Kamble. 2000. Effect of Low Temperature Exposure on the Supercooling Point of Oriental Cockroach. J. Entomological Science. 35(4): 444-451. Byers*, Mathew E., Shripat T. Kamble and John F. Witkowski. 2000. Assessing Insecticide Vapor Drift During and After Center-Pivot Chemigation to Corn Using Glass Plates and Gauze Pads. Bulletin of Environ. Contam. Toxicol. 65:522-529. Pachamuthu*, Pari, S. T. Kamble, T. L. Clark and J. E. Foster. 2000. Differentiation of Three Phenotypically Similar Blattella spp. : Analysis with Polymerase Chain Reaction-Restriction Fragment Length Polymorphism of Mitochondrial DNA. Ann. Entomol. Soc. Am. 93(5):1138-1146. Park*, No-Joong and Shripat T. Kamble. 2001. Decapitation Impacting Effect of Topically Applied Chlorpyrifos on AchE and Esterases in Susceptible and Resistant German Cockroaches. J. Econ. Entomol. (94(2): 499-505. Cabrera*, Brian J. and Shripat T. Kamble. 2001. Effect of Decreasing Thermophotoperiod on the Eastern Subterranean Termite. Environ. Entomol. 30(2):166-171. Cabrera*, Brian and Shripat T. Kamble. 2004. Super-cooling Differences in the Eastern Subterranean Termites (Isoptera: Rhinotermitidae). J. Entomol. Sci. 99(4): 525-538. Spomer*, Neil and Shripat T. Kamble. 2005. Effect of Temperature on Noviflumuron Performance Against the Eastern Subterranean Termite (Isoptera: Rhinotermitidae). Sociobiology. 46(2):335-348. Kamble, Shripat T. and Robert W. Davis. 2005. Innovation in Perimeter Treatment Against Subterranean Termites (Isoptera: Rhinotermitidae). pp. 197-203. In Chow-Yang Lee and William H. Robinson (eds) Proc. 5th Inter Conf. Urban Pests, Singapore. P&Y Design Network, Penang, Malaysia. Kamble, S. T. and R. K. Saran. 2005. Concentration Dependent Degradation of New Generation Termiticides and their Bioavailability to Eastern Subterranean Termite (Reticulitermes flavipes K.). Bull. Environ. Contam. Toxicol. 75: 1077-1085. Spomer*, Neil and Shripat T. Kamble. 2006. Temperature Effect on Kinetics of Uptake,Transfer and Clearance of 14C-Noviflumuron in Easter Subterranean Termites. J. Econ. Entomol. 99(1): 134-140. Mamo*, M. W. L. Kranz, E. R. Doskey, S. T. Kamble and J. F. Witkowski. 2006. Impact of Tillage and Placement Methods on terbufos Insecticide Runoff. Manuscript SW-06085-2005, Applied Engineering in Agriculture. Accepted. Husen, Timothy J., Shripat T. Kamble and Julie M. Stone. 2006. A Characterization of Subterranean Termites in Nebraska Using Micro-morphological and Molecular Techniques. Sociobiology.48(1):247-266. DeHeer*, Christopher J. and Shripat T. Kamble. 2008. Colony Genetic Organization, Fusion and Inbreeding in Reticulitermes flavipes from the Midwestern U.S. Sociobiology. 51(2): 307-325. Spomer*, Neil A., Shripat T. Kamble, Richard A. Warriner and Robert W. Davis. 2008. The Influence of Temperature on Rates of Uptake and Subsequent Horizontal Transfer of 14C-Fipronil by Eastern Subterranean Termites (Isoptera: Rhinotermitidae). J. Econ. Entomol.101(3): 902-908. Saran*, Raj K. and Shripat T. Kamble. 2008. Concentration Dependent Degradation of Three Termiticides in Soil under Laboratory Conditions and Their Bioavailability to	Eastern Subterranean Termites (Isoptera: Rhinotermitidae). J. Econ. Entomol. 101(4):1773-1743. Spomer*, Neil A. and Shripat T. Kamble. 2008. Translocation of 14C-Fipronil from a Treated Zone into Artificial Foraging Galleries by Reticulitermes flavipes (Isoptera: Rhinotermitidae). Sociobiology. 52(1): 207-220. Davis*, Robert W. and Shripat T. Kamble. 2008. Dispersal of Permethrin and a Water Soluble Dye Affected by Soil Types and Rodding Tips After Subsoil Rodding Applications. Sociobiology. 52(2): 1323-1344. Davis*, Robert W. and Shripat T. Kamble. 2009. Distribution of Chlorpyrifos and a Water Soluble Dye Affected by Rodding Tips and Soil Types Following Subsoil Applications to Control Subterranean Termites (Isoptera: Rhinotermitidae). Sociobiology. 54(1): 175-198. Spomer*, Neil A., Shripat T. Kamble and Blair D. Siegfried. 2009. Bioavailability of Chlorantraniliprole and Indoxacarb to Eastern Subterranean Termites (Isoptera: Rhinotermitidae) in Various Soils. J. Econ. Entomol. 102(5): 1922-1927. Spomer*, Neil A. and Shripat T. Kamble. 2010. Sorption and Desorptopn of Fipronil in Midwestern Soils. Bull. Environ. Contam. Toxicol. 84:264-268. DOI 10.1007/s00128- 009-9915-1. Spomer, Neil A. and Shripat T. Kamble. 2010. Mineralization of Indoxacarb 150SC Termiticide in Urban Soils Used Against Subterranean Termites (Isoptera:	Rhinotermitidae). Sociobiology. 55(1):197-215. Spomer*, N. A., S. T. Kamble, M. Coffelt, C. Scherer. 2010. Movement of Chlorantraniliprole and Indoxacarb Termiticides in Various Soil Columns. Bulletin of Environ. Contam. Toxicol. Submitted. Nov. 19, 2009. * Indicates that the senior author was a graduate student/post-doc under Dr. Kamble's direction. 37	symposia organized and moderated at regional, national and international conferences. 13 Scientists to present seminars at the University of Nebraska, Lincoln. Excellence in Graduate Student Mentoring Award 2009. Agri. Research Division, Univ. of Nebraska, Lincoln. Outstanding Advisor of the Year 2009. Student Impact Award, University of Nebraska, Lincoln, NE. Subject Editor 2008-present. Urban Entomology (Structural) Section for the Arthropod Management Tests, ESA. Plaque 2008. Thirty Years of Service, University of Nebraska, Lincoln. Plaque 2008. Termite Training Workshop. Board Certified Entomologist (BCE) Award, North Central Branch-	Entomological Society of America (NCB-ESA). 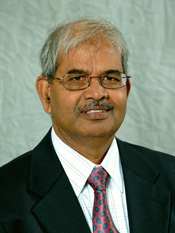 Elected Executive Member At-Large, 2006. North Central Branch, Entomological Society of America. Governing Board Member: Section-F, 2001-2006. Entomological Society of America. Excellence in Team Programming - Urban Pest management Conference, 2005. University of Nebraska - Extension. Director, Board Certified Entomologists, 2001. Entomological Society of America. Chair, 1999-2000. National Conference on Urban Entomology. State Team Award, 1999. Urban Pest Management sponsored by Epsilon Sigma Phi. Certificate, 1998. The ESCOP and ACOP Leadership Development Program. Chair, 1994-2001. Examining Committee, ESA-Board Certified Entomologists. Award of Merit, 1998. North Central Branch of the Entomological Society of America. IR-4 Meritorious Service Award, 1996. National Award for Distinguished Service to the Board Certification Program, 1995. NCB-ESA Recognition Award in Urban Entomology. 1994. Outstanding Entomologist of the Year, 1992. BCE-Mid America of ESA.